Or maybe Thirteenth. We're not sure yet. I'm talking about Doctor Who, of course. With the announcement of Peter Capaldi as the Twelfth Doctor (or maybe Thirteenth) the Nerd World has a new Pope. 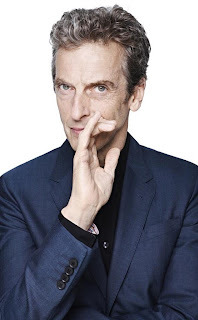 Capaldi's one of those actors who has always performed brilliantly in everything you've seen him in and if you watch TV or films, you've seen him in things. If you went to see World War Z (which I didn't) he was the W.H.O. Doctor. When I first heard his name had been thrown in the hat early last week, I had a great feeling that he was the sure bet. His Scottish roots, his previous collaboration with two-time episode writer Neil Gaiman (Neverwhere), the fact that he'd been on the show before (in fact in the same episode as Karen Gillan) all made him - in my mind at least - a near lock. Of course that didn't preclude showrunner Steven Moffatt and the producers of Doctor Who throwing us a complete curve and announcing someone else. After all, Moffatt's claimed that he's "lied his arse off" about what's coming up in the 50th anniversary special that's due in November. And once that's over there'll be intense speculation about the Christmas special (ostensibly when the Eleventh (or Twelfth) regenerates into the Twelfth (or Thirteenth). You've seen the last episode of the latest series, right? I mean you know that John Hurt's been introduced as The Doctor, don't you? You understand the confusion? What I like about the choice of Capaldi as The Doctor is that he's bringing a little more age to the role than has been there since Christopher Eccleston helped relaunch the series. I'm curious to see if there's going to be a bit more anger than Matt Smith brought and certainly we'll see the weariness more visibly that both David Tennant and Smith could only hint at. Capaldi is also capable of dropping a lot of weight behind the anger and weariness. At the same time, if it's called for, Capaldi is an extremely sensitive actor. He's got all the tools to make the Doctor the embodiment of every other Doctor there has ever been. It's an exciting time. Unfortunately we won't know how Capaldi will be as the Doctor until the series resumes in 2014. In the meantime, we can watch any number of roles that Peter Capaldi has given us. I'll likely watch Torchwood: Children of Earth three or four times before he comes on board.